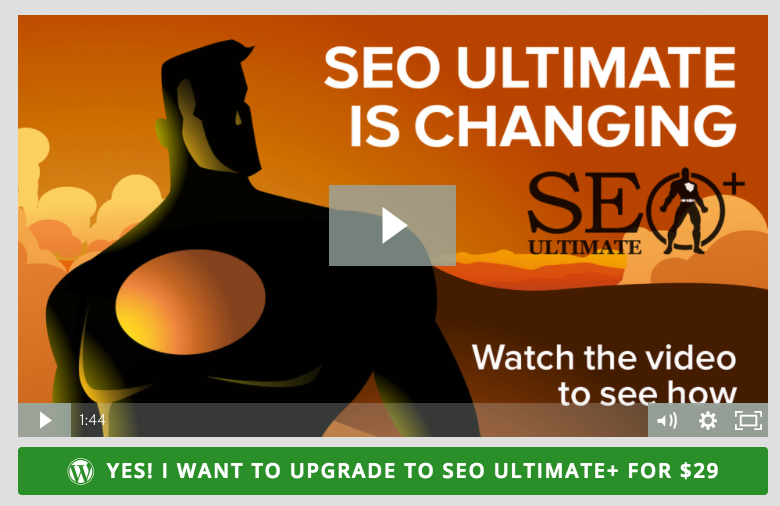 SEO Ultimate Plus Upgrade : Is it worth it ? Just a quick note to mention few of my wordpress settings have been lost during the upgrade from SEO Ultimate (free version) to SEO Ultimate Plus (premium version). Even if the authors indicate that no settings will be lost during the process I have to say that was not my case at all. I followed the basic tutorial they provide on their site, which consists of simply desactivating and removing the old plugin and then activate the new using the license key sent by email. Among things I’ve lost : Link mask generator entries, Main title tags and Deep links. Fortunately for me I had a backup and managed to recover by copy/pasting most of these lost settings. This may have been caused by another cache plugin (WP super cache) but I’m not too sure. 1) deactivate (don’t delete) SEO Ultimate+ and reinstall SEO Ultimate (FREE version). 2) go to Settings > Export > SEO Ultimate > get both the dat file and also export the deeplinks. Then once you activate the license again, then go to Settings > Import > import the settings > import the deeplinks. Anyway, if you’re wondering if the upgrade is necessary I would say yes as the classic free SEO Ultimate is apparently going depreciated. So it’s a kind of a forced update I would say. Considering Yoast as an alternative could be a good option if you’re tired of SEO Ultimate. I personally think it does the job though and it’s still an excellent plugin. Additionally if you noticed that your Google Review Snippets don’t work anymore on your review articles then upgrade to the premium version and they will appear. Money magic. SEO Ultimate Plus gives at least an excellent customer support. Emails are mainly answered by Jeffrey within 48 hours maximum, which is not that bad. I’m happy so far with all the answers I got from him. Some of my questions pointed out technical issues, such as the impossibility to get the Open Graph settings taken directly from the post itself without having to edit them manually each time you post something. Mass editing can also be a real pain if you have like me thousands of articles stored in your database. Some of my feedbacks seem to have been taken into consideration for further updates. Let’s see how this plugin grows now it’s not free anymore.